Chord & Major review - (Rock) major 8`13 and (Ballad) Major 6`13. (Rock) major 8`13 and (Ballad) Major 6`13. I first encountered Chord & Major at the e-earphone show in late 2015 in Tokyo, Japan. They invited me to their table to try out their earphones and I had a quick listen, I suspect they were fresh out of the box which isn`t wise for a show - I could be wrong. But I see it happening at many of the Japan shows, staff congratulating me for being the first to try out a product, sometimes even wrapping off the plastic or protective slip of the screen cover. Whether you believe in burn in, or loosing up or whatever it does seem to round earphones and gear out a bit more after a few hours of music have settled all the parts. So my first encounter was ok, but not brilliant. I wasn`t so sure about the metal flanges either. I recently had a listen of the Chord & Majors I received from the Japan based contact (I guess I must have handed them one of my Gifu washi hand made meishi/business cards) straight out of the box. The sound was similar. I then decided to leave them playing music for 24 hours to see If there was any changes to the sound. More on the result of that experiment later. 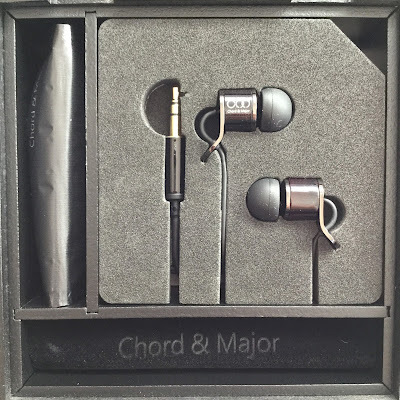 Chord & Major also have a giveaway of some of their earphones, end date of entry is February 24th. World Music, Ballad, Jazz, Rock and Classical models. Lets start with the packaging which some of you may have seen in the early unboxing article. It certainly is beautiful. I am a fan of using natural materials and a wooden box is a plus in my world. Open up the box and the IEMs are encased nicely in a die cut piece of cardboard, on the back of which is hidden a cord winder designed for the user to wrap their earphones cable around safely. Lift that out and the box is segmented into three compartments. One for additional tips encased in plastic wrap and a small cleaning brush, a small cloth (velvet?) carry pouch with Chord & Major embossed on it and also a guitar on the back. The main space is reserved for the IEMs which are safely and gently held with a bed of foam, the underneath is reserved for a user manual. On to the main event, the earphones themselves. I will double up here as the build is virtually identical, with a variation in the outer casings. The plug is small and lightweight and has additional support for the cable to prevent early stress tearing. Also the splitter has extra support. There is also a small rubber chin slider. The Rock version is made of metal and is solid as a rock. I did not really understand the thinking behind the metal drooping tail at the cable end of the earphones but I now see that is useful for placement and helps to navigate a decent seal. Also a close look shows that there is a tiny rubber ring which anchors the cable with slight resistance to prevent stress and breakage in those moments of forgetfulness. The bore is wide and open with a metal mesh covering it. The Ballad version is the same as above with a few differences. 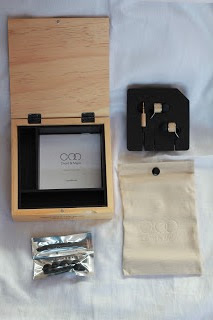 the cable strengthener by the plug is wooden and the outer casing of the earphones is also wooden. The Rock version is slightly heavier than the Ballad version when held in my hands. This time I had a listen straight out of the box and tried to compare with my memory of first impressions at the e-earphone show in Tokyo. It was very similar and led me think that perhaps the ones I tried there were also fresh out of the box. I then set them up and left both sets of earphones to loosen up over a period of 24 hours plus to see If the result would be more palatable. These are the results. Centrance Hifi-Skyn with ipod touch 6G and Flacplayer app. Definitely has enough bass to please even the most jaded bass lover, seems to be tight enough where is counts, slightly rounded and smoothed and extends down into the sub bass. The over extended highs and sharpness which i first encountered has disappeared after leaving them to play for a bit, this is also noticeable in the rolloff shown in the specs graph. 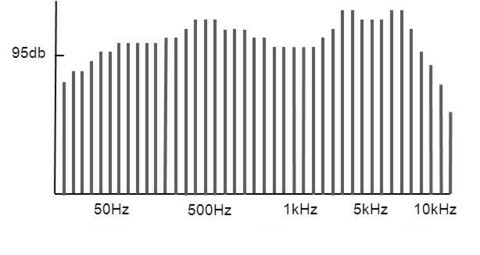 They have a height and depth, but not as much width in terms of sound stage. Separation between instruments is more than adequate. It is not a fast earphone, but well paced. Vocal are clean and clear and a pleasure to listen to., I really enjoy female vocals with the Rock version. Strings and guitar comes across accurately. I find myself liking them the longer they are in my ears. As expected the Ballad version is a more laid back sound signature with an emphasis on the mids. Although less dynamic than the Rock version it doesn`t lose out by that simple comparison. It performs just as well, just quieter and less forward. All the key points that I enjoyed with the Rock version are also present here, a good sound stage, decent separation between the various instruments. 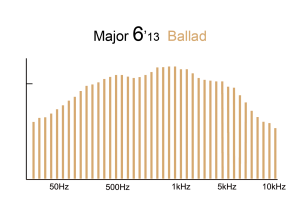 The vocals are more forward on the ballad version, whereas on the Rock version there is a more balanced sense of vocals and music. The height and depth is less than on the Rock, although width seems wider. There is a spaciousness to them, almost an airy sense without getting too whimsical. The Ballad version is fairly smooth and non offensive to the ears. If I would sum up the Ballad in one word it would be tame, there are no particular sacrifices. I recommend giving the Ballad and Rock versions time to open up to get the best experience. Either through general everyday use or leave them over night playing some music of your choice. I found the fit to be suitable and isolating enough. I did not notice any leakage as such. I prefer a larger tip, the Ballad version came with a smaller tip and did notice a bit of rubbing against my outer ear, it could do with a more tapered nozzle as its a bit squared off at the end. The Chord & Major can be worn hanging down or over the ear, although i suspect the design is meant more for hanging down. I mainly ended up wearing them over the ears as that is my usual custom. Over the ears also minimized the rubbing I experienced when they were hanging down. 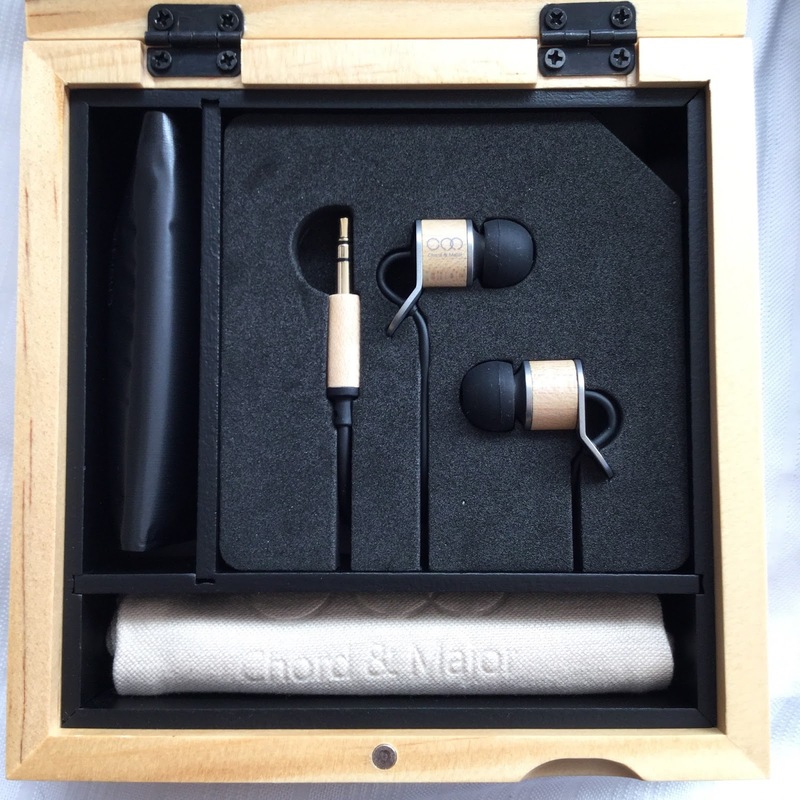 The global prices of the Chord & Major earphones are from 199 USD ~ 239 USD. The prices are at the low end of mid range and these IEMs seem to fit within that price point well. They aren`t sub $100 nor are they $500 plus in terms of sound. Build: I can`t fault the build as it does appear to be rather robust, although albeit I have only had them for a short time. Sound: The sound fits perfectly within their pricepoint and I have no real complaints. Fit: They seem to fit reasonably well, much better than when I first tried them at the e-earphone show when I was in a hurry. The metal tab helps with positioning for a comfortable fit. They seem to feel quite weightless when settled in properly. Results could vary depending on tips used and size of ones ear holes. Value: With the excellent packaging, solid build and proper price point I would say that they are good value. Of course the $200-$250 USD price point is saturated with many choices of good in ears to compete against also. A big thank you to Chord & Major for sending these two earphones for review.